Sometimes I forget how intimidating a playground can be when you are little. 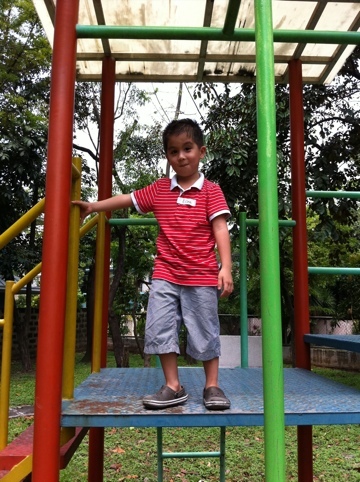 Edan, my second, stood in front of the fireman pole at the playground with much trepidation. 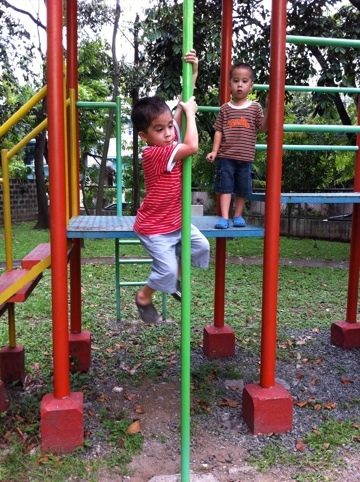 He had seen his older cousin effortlessly slide down the pole but he wasn’t sure if he could do it himself. I saw him take a moment to consider the risk. As my more calculated son he probably looked at the gap between his footing and the pole and thought, uh oh. I tried to encourage him with phrases like, “You can do it! Go ahead, try it!” But I saw the uncertainty in his eyes and so I said instead, “I will help you.” A smile broke across his face as I reached out my arms so he could use me as a bridge to cross over to the pole and wrap himself around it. Then he slid down on his own and said, “Again, mommy!” I assisted him several times and then I stepped away for awhile and got into a conversation with my brother, Paul. In a few minutes Edan was calling out my name and saying, “Come watch me, mom! I can do it!” And sure enough I turned my head to see him grabbing hold of the pole himself and sliding down with ease. I was so proud of him and he was pleased with himself, too! This small victory for Edan provided me with a nice reminder about parenting. Our children will have many “fireman pole experiences” to get through as they grow up. We can never underestimate the power of our presence in their lives to help build self-confidence. Sometimes they will want to be carried, other times they will want a hug, a kiss, or a few kind words to allay their fears. And then they will surprise us like Edan surprised me! They will take on the challenge before them and conquer it! Sometimes, I feel I can conquer the world and yet here I am homeschooling three active sons. I am once again reminded that my sons may not need me all the time but I want to be readily available for them whenever they need me. And I am on an assignment not to change the world but to shape my kids into God’s image and who knows, God may use my sons to change the world through the Gospel of Christ..